Follow live: It’s National Signing Day! Who’s coming to Texas? For more non-Longhorn National Signing Day news, check out the Austin American-Statesman’s Statesman U and Varsity News blogs. With 24 commitments, it appears Texas will finish with a top-10 recruiting class, regardless of website. Most have UT tops in Big 12. 1:27 p.m.: It looks like the Lone Star State still prefers burnt orange. 1:25 p.m.: It’s official, Jordan Elliott is headed to Texas. 1:20 p.m.: Texas’ recruiting class was beefed up after News Year’s Day. Texas' six highest-rated recruits all committed after the new year. Very impressive job by the coaching staff. 1:15 p.m. : And unless something crazy happens, that should be it on 2016 Texas recruiting class, and people are happy. 1:15 p.m.: Jordan Elliot is coming to Texas. 1:10 p.m.: Dr. Lou’s grandson, Longhorn Trey Holtz, had to tweet about his grandpa doing the dab. 1:00 p.m.: It’s official, Jean Delance is a Longhorns. 12:39 p.m.: The latest recruiting rankings have the Longhorns at No. 11. #Longhorns slip out of top 10, at least temporarily. 11th in 247Sports composite rankings of all top recruiting services. 12:36 p.m.: Texas Tight ends reach out after Peyton Aucoin commits to Texas. 12:10 p.m.: People are really having fun with Jeffrey McCulloch‘s nickname. 12:06 p.m.: LSU will have the No. 1 recruiting class in the country, but Texas did steal one of their commitments. That loud boom you heard from Louisiana was No. 27 Kristian Fulton picking #LSU and virtually locking up the No. 1 class on #SigningDay. 11:39 a.m.: Brandon Jones chose Texas even though a Texas A&M website made a documentary about him. True story. 11:20 a.m.: Chris Daniels excited that history is being made at Texas, but he better plug his phone in. Very classy remarks by Mack Brown on Charlie Strong and his coaches — Brian Jean-Mary, Sterlin Gilbert, Brick Haley and Jeff Traylor. 11:16 a.m.: Some recruits are starting to gloat about signing day, and they probably should. 11:11 a.m.: Chat with Kirk and Ced on National Signing Day. 11:08 a.m.: Texas’ recruiting class is now a top 10 ranked class. 10:48 a.m.: Chris Brown is very excited to join Texas, and it’s official. He’s coming to Texas. 10:47 a.m.: It’s official, Jeffery McCulloch is headed to Texas. 10:36 a.m.: Texas is loading up on defense today. Texas has picked up eight commits in the past two days. It'll grow to nine if DT Jordan Elliott picks the Horns at 1 p.m.
10:34 a.m.: Texas defensive Charlies Omenihu reacts to recent signee. BOOM BOOM BOOOMM 🤘🏽🤘🏽🤘🏽 @jmcculloch17 welcome brother ! 10:31 a.m.: Aldine Davis linebacker Jeffery McCulloch is coming to Texas. Aldine Davis LB Jeffrey McCulloch picks Texas over Notre Dame, Stanford and the Aggies. Texas' LB room is loaded right now. 10:28 a.m.: Erick Fowler and the Longhorns have the LSU tigers in their future. Manor LB Erick Fowler of #Longhorns will have chance to play #LSU in 2019 to see if he made right choice by backing out of his commitment. 10:27 a.m.: Texas standout Kris Boyd welcomes his new teammates. @BlessedJones33 LIL BRO!!!!!!!! !😈🐂 WELCOME!!!! #DBU! I told you on your OV we gone take care of you! 10:25 a.m.: It’s official, Andrew Fitzgerald is coming to Texas. 10:23 a.m.: Everyone is dabbing now. Even Erick Fowler. 10:16 a.m.: Charlie Strong dancing after Erick Fowler signs with Texas. 10:14 a.m.: If Texas keeps this up, it could soon be a holiday in the Lone Star State. 10:04 a.m.: One of the best defensive backs to ever play at Texas is chiming in on this signing day as Brandon Jones is coming to Texas. 10:03 a.m.: Kirk Bohls is not dodging people. 10 a.m.: Our hourly update, Texas continues to climbs up recruiting rankings, and is now tops in the Big 12. It's almost 10 a.m. Texas now has 21 commits, the No. 1-ranked class in the Big 12 and serious momentum. McCulloch, Elliott still out there. 10 a.m.: It’s official, sorry LSU, Erick Fowler is staying in Central Texas. 9:57 a.m.: “DB U” is ready to welcome a new class. 9:56 a.m.: Can’t win them, but I’m sure Texas is still happy with day’s results. Not a huge reception when Elsik ILB Dontavious Jackson announced to Florida State. Texas missed out there. Still a big day in Austin. 9:55 a.m.: Tope Imade’s paper work is in, he’s going to Texas. 9:55 a.m.: Even though Jackson didn’t also come to Texas, is dominating signing day and people are taking notice. 9:50 a.m.: Dontavious Jackson bucks the trend, signs with Florida State instead of Texas. Teammate Chris Brown of Alief Elsik signed with Texas a moments ago. 9:47 a.m.: Reggie Hemphill-Mapps is covered in burnt orange. 9:45 a.m.: Malik Jefferson welcomes his new standout safety. #Alabama has already soared past #LSU into 2nd place in the 247Sports composite rankings, trailing only The Ohio State University. 9:40 a.m.: Last year’s big recruit on this year’s recruiting class. Texas LB Malik Jefferson on LHN: "It's very exciting. We want to see kids come here, want to lift this program and be excited." 9:37 a.m.: Who’s next, who’s done? 9:35 a.m.: Alief Elsik’s Chris Brown is coming to Texas. 9:35 a.m.: Jean Delance makes it official, he is coming to Texas. 9:30 a.m.: Recruits are having fun on this busy National Signing Day. 9:25 a.m.: We’re guessing multiple fax machines are working at Texas right now. 9:23 a.m.: Marcel Southall makes it official, he’s coming to Texas. 9:20 a.m.: Lil’Jordan Humphrey makes it official, he’s coming to Texas. 9:20 a.m.: Eric Cuffee is styling on signing day after making his Longhorn commitment official. 9:15 a.m.: Texas has soared up the national recruiting rankings today. Checking the national recruiting rankings: Texas is now up to 9th (Scout), 11th (247sports) and 15th (Rivals). Still waiting on: S Chris Brown, LB Dontavious Jackson, LB Jeff McCulloch, DT Jordan Elliott. Would not be surprised if Texas goes 4-for-4. 9:10 a.m.: Imagine what could be down the road? If Charlie Strong can close like this after 5-7 and 6-7 seasons, imagine his muscle when Texas starts winning games. 9:07 a.m.: It’s official, Chris Daniels is coming to Texas. 9:05 a.m.: Zach Shackelford, a 2016 recruit already on the 40 acres predicted a big signing day for the Longhorns, now he’s pretty happy it came true. 9:00 a.m.: More reaction Erick Fowler heading to Texas. 9:00 a.m.: Texas target Stephon Taylor is headed to South Carolina. New Orleans DT Stephon Taylor picks South Carolina over Texas. 8:55 a.m.: Erick Fowler is heading to Texas, switching from LSU to Texas on National signing Day. Manor LB Erick Fowler, leaning hard toward LSU, changes mind, flips to Texas. Charlie keeps rolling. 8:52 a.m.: Texas loses out on Manvel safety Deontay Anderson, who is going to Ole Miss. 8:50 a.m.: The paper work is in for 5-star Brandon Jones. 8:45 a.m.: It’s been a good morning for Texas. Texas now has nine recruits from the ESPN 300. Five committed in the last 24 hours. 8:45 a.m.: Class of 2016 recruit Shane Buechele is already on the 40 acres, but he’s loving this signing day. 8:40 a.m.: More on Brandon Jones. 8:40 a.m.: Kyle Porter of Katy makes it official, he’s coming to Texas. 8:35 a.m.: Mack Brown tells it like it is. Mack Brown asked on ESPNU if this is becoming a good day for Charlie Strong: "Think it's already been a real good day." 8:33 a.m.: Brandon Jones, a 4-star safety is heading to Texas. Nacogdoches five-star safety picks Texas over A&M and Baylor. 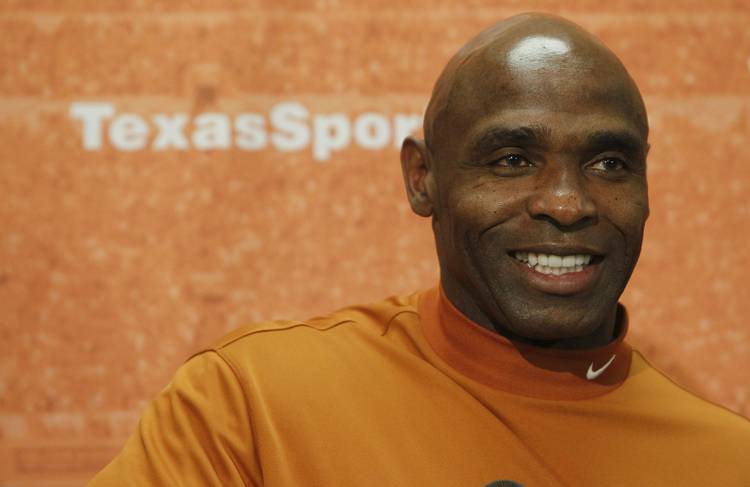 That's a Malik-level get for Charlie Strong. 8:25 a.m.: Coach Mack Brown pretty much owned signing day when he was at Texas. 8:20 a.m.: D’Andre Christmas-Giles makes it official, his paperwork is in. Texas confirms that Davion Curtis, Eric Cuffee, D'Andre Christmas-Giles have all sent in LOIs. Remaining targets: Brandon Jones, Erick Fowler, Chris Brown, D. Jackson, Deontay Anderson, Jeff McCulloch, Jordan Elliott, Stephon Taylor. 8:15 a.m.: More well-wishes from current Longhorns to signees. 8:15 a.m.: That’s so Tope. Tope Imade makes it official by signing with Longhorns. Trinity DT Chris Daniels to Rivals: "A lot people that are silently committed, a lot of people who are committed." 8:10 a.m.: Waco’s Eric Cuffee is officially a Longhorn. 8:10 a.m.: Texas went shopping for defensive tackles this month. Euless Trinity DT Chris Daniels picks Texas. That's three DTs who've committed to Texas in the past 10 hours. 8:04 a.m.: A huge get for Texas as Euless Trinity’s Chris Daniels is headed to Texas. 8:00 a.m.: Texas’ recruiting class is now ranked No. 25 nationally. 8:00 a.m.: Davion Curtis is officially headed to Austin. 8:00 a.m.: Texas suffers its first loss on signing day as Patrick Hudson picks Baylor. 7:45 a.m.: Texas lands another major piece in Duncanville’s Marcel Southall. 7:45 a.m.: Some Longhorns are giving sound advice on National Signing Day. 7:40 a.m.: Manvel’s Reggie Hemphill-Mapps has signed his letter of intent, check out his thoughts on the Longhorn football. Texas confirms that Peyton Aucoin, Denzel Okafor and Reggie Hemphill-Mapps have all sent in their LOIs. 7:20 a.m.: Is it really too early to start talking about the class of 2017? Never. A big g piece of that class is going to enroll early. 7:20 a.m.: D’Andre Christmas-Giles committed to Texas last night, but he officially signs at noon. 7:15 a.m.: Southlake Carroll product Lil’Jordan Humphrey committed to Texas this past weekend, but this morning he made it official. 7:15 a.m.: Obi Eboh was committed to Texas up until last month. The Southlake Carroll defensive back signed this morning with Stanford. 7:00 a.m.: Davion Curtis already committed to Texas, but he’s making it official today. 6:45 a.m.: The Longhorns are up and ready for National Signing Day, so says first-year graduate assistant Jordan Traylor. 6:35 a.m.: Texas target Dontavious Jackson has started his day and is already thinking about the future. Jackson will commit around 9 a.m.
6:00 a.m.: What did you miss last night? Well, Texas received an early Christmas present when New Orleans product D’Andre Christmas-Giles committed late Tuesday night. It capped off a great Signing Day eve as Texas also landed a four-star running back earlier in the day, Kyle Porter of Katy.